You cannot listen to the pronunciation of he liao because your browser does not support the audio element. 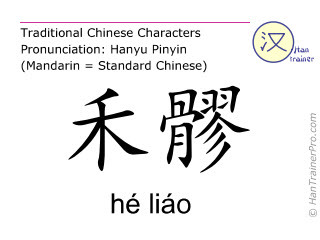 The modern (simplified) Chinese characters of hé liáo are identical with the traditional characters displayed above. cereal | cavity | cereal cavity | "This point is also named 口禾髎 (kŏu hé liáo)"